As I wrote in my initial blog about the Covered Bridge Metric Century, this is really a bucket list ride. The Covered Bridge Metric Century is relatively easy. I ride in the Blue Ridge Mountains in Virginia and even our easier rides are harder than this Metric in terms of the terrain. The Metric only climbs 2464 feet over 63 miles according to my Strava. There is no single, memorable hill that was awful. The ride is constantly undulating, which I like because you get out of the saddle fairly often. Horse poop. This is Amish Country. There is more than the occasional horse and buggy and horses do what horses do. Soooo…. keep your eye on the road. When it’s dry it doesn’t matter so much — but when that stuff gets wet…. Well it’s best to avoid tire spray. This horse didn’t poop — but if you look behind the carriage, it wasn’t long ago than one did. Covered Bridges are awesome. In reality you come upon the bridges, and pass through them so quickly, that it’s hard to really appreciate the beauty and simplicity of the construction — which has lasted since the 1800’s. Pennsylvania has more of these bridges than any other state, and it’s worth doing this ride just to say you have ridden through some of these treasures. I rode the Going to the Sun Road and enjoyed the unbelievable vistas in Montana, but the Covered Bridges and Amish countryside deserve an equal spot on the bucket list. This Ride is capped at 2,000 riders. A club member told me that the ride, which will celebrate its 40th year in 2017 once attracted as many as 4,000 riders. 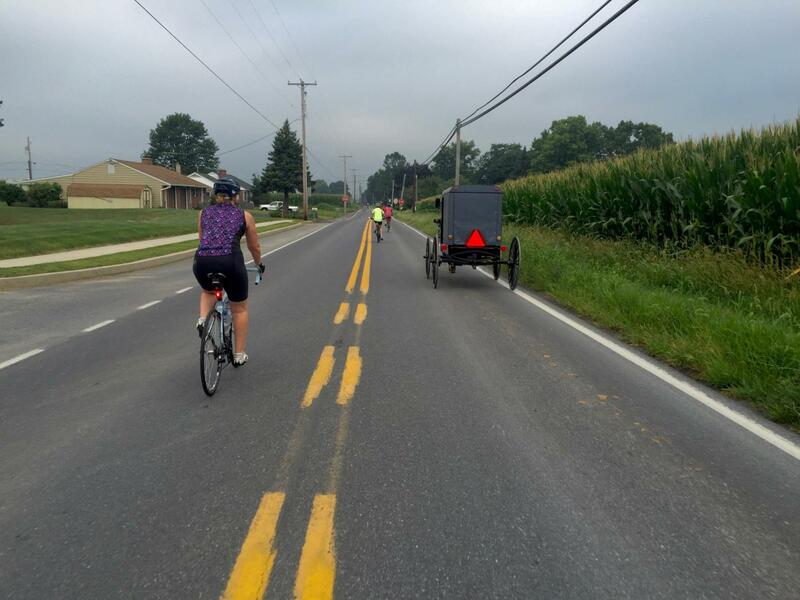 Now the Lancaster Bike Club wants a more manageable 2,000. My wife and I signed up just two weeks before the event in 2016 and got in — so it’s not like you have to be on line the moment registration opens. On the other hand, don’t try to sign up the day of the event. The Lancaster Bicycle Club nails it. After 39 years, these people have figured out how to put on a major bike ride. There is ample parking. There are swarms of informed volunteers. The rest stops are perfectly spaced 10-12 miles apart and the road is well marked with a unique arrow that looks like a covered bridge. 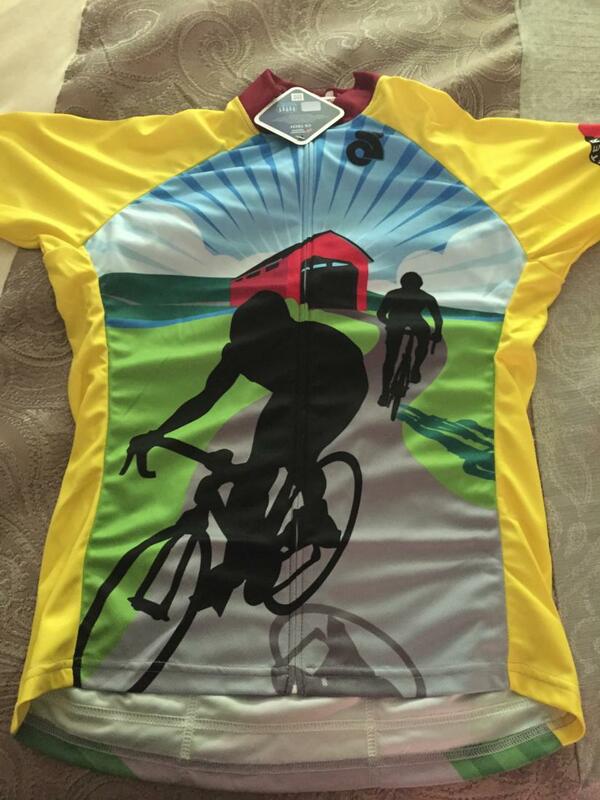 In my opinion, the jersey for the Covered Bridge Metric Century is well designed and at $65.00 — fairly priced. I should mention that one of the rest stops is not just a “rest” stop but an actual lunch stop, complete with complementary Subway sandwiches. The sandwiches were also available in the tent at the finish. Bonus Takeaway: Mary and I enjoyed a great local cold beer at the Lancaster Brewing Company. Definitely worth a stop. For dinner we enjoyed our meal in downtown Lancaster at Character’s Pub. Also worth a look. And one other note. I discovered Hammond’s Pretzels on this ride. They had baggies of them at rest stops. They were so good we stopped at a grocery story and bought a three pound box of them to take home. Trust me on this one. Enjoy. If you go: The Club wants you to sign up ahead of time so they can send you the wrist band that marks you as an official participant. All of the information is on the Club’s Website which you can find here. John,thanks for the kind words. Our volunteers really go all out to put on the best event possible. Reading your appreciative review makes it all worthwhile. Would it be OK to reprint this blog in our monthly newsletter?